Already have rollers? OpenSprints Electronics will work with ALL roller systems. Even though we recommend the Kreitler Goldsprints Roller Racing Stations; OpenSprints Electronics will work with all roller systems. Just make sure the roller drums have the same diameter, as the firmware/software currently doesn't support different diameters. 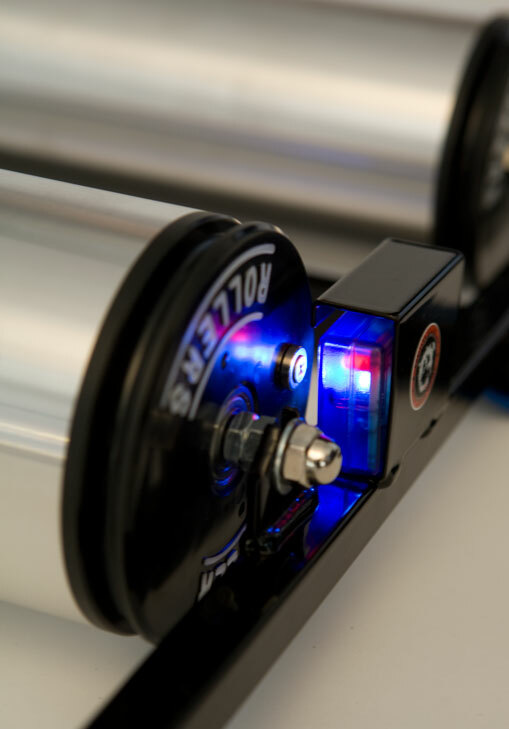 If you aren't using the Kreitler Goldsprints Roller Racing Stations, you will be responsible for mounting your own magnets and OpenSprints Sensors. Use the picture below as an example. Magnets have a north and a south pole, OpenSprints sensors work better with one than the other. So wave the magnet in front of a working sensor and see which side of the magnet lights up the white LED in the senor from further away. Use industrial velcro, duct tape, or zip ties to mount the sensor so the hall effect sensor is facing the roller drum. Screw the magnet into the side of the roller drum so that it lights up the sensor when it passes. If it doesn't light up, move the position closer to the hall effect sensor. NOTE: This isn't the jesus nut on a helicopter, and magnets are brittle, so don't over tighten. Make sure the ethernet cables and OpenSprints Sensors are not in danger of being stepped on or damaged. Keep the rollers and bikes from tipping over by fixing the rollers down to boards. The Kreitler Goldsprints Roller Racing Stations connect together and do not require this step.